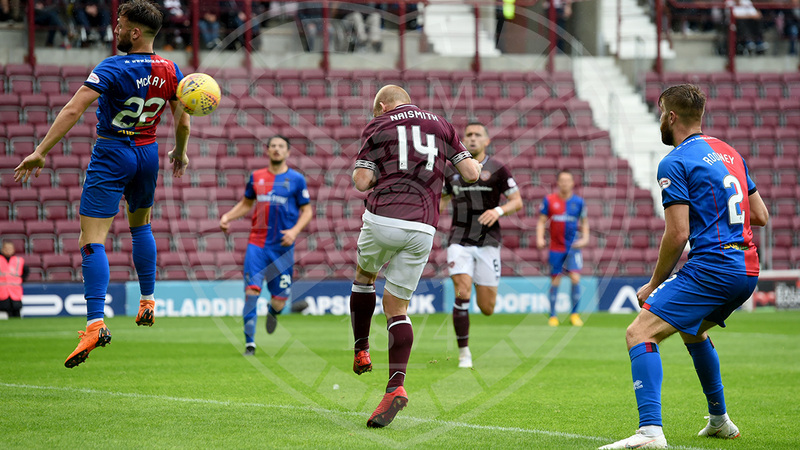 Hearts topped Group C of the Betfred Cup with an emphatic 5-0 victory over Inverness CT this afternoon. 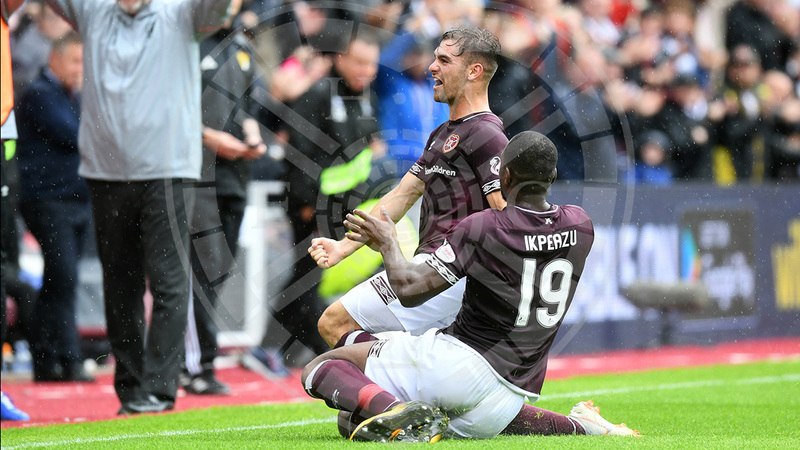 Uche Ikpeazu set the Jambos on their way to a stylish win with a brace inside five first-half minutes, either side of Ben Garuccio’s stunning free-kick. Steven Naismith added goals four and five in the second half to make sure the men in maroon made it into the competition’s knockout stage. Craig Levein made three changes from the side that disposed of Cowdenbeath in midweek; Ikpeazu started ahead of Kyle Lafferty, Aaron Hughes came in for his first start of the season with Michael Smith missing out through injury while Olly Lee replaced Andrew Irving. Hearts started brightly, attacking from the off. Christophe Berra’s diving header from Lee’s cross seemed destined for the bottom corner but Carl Tremarco got enough of a touch on it to send the ball wide. 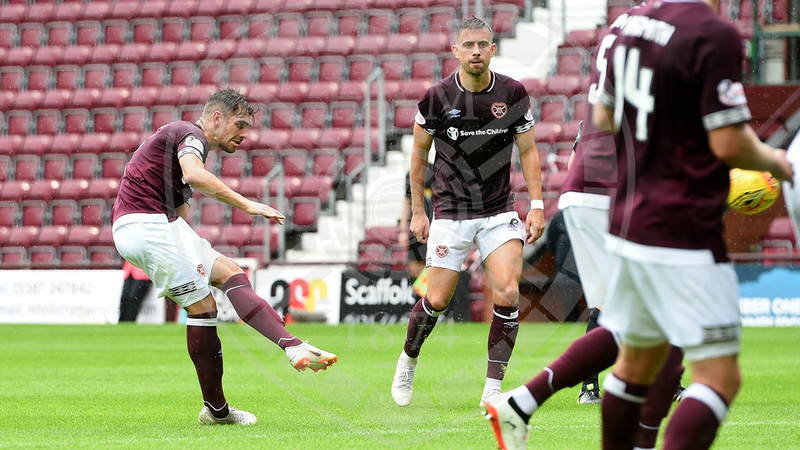 The Jambos had a big penalty shout not long after, when Brad McKay chested the ball down onto his own arm inside the box, but referee Willie Collum waved play on. Ikpeazu was proving a menace and nearly capatilised on Coll Donaldson’s inability to clear Garuccio’s cross, but the big striker couldn’t get the ball out from underneath his feet and the danger was cleared. Inverness carved the game’s best chance 13 minutes in. Liam Polworth moved the ball to Tom Walsh, who darted forward before finding Joe Chalmers on the overlap, but his low shot was driven inches wide of Zdenek Zlamal’s left-hand post. 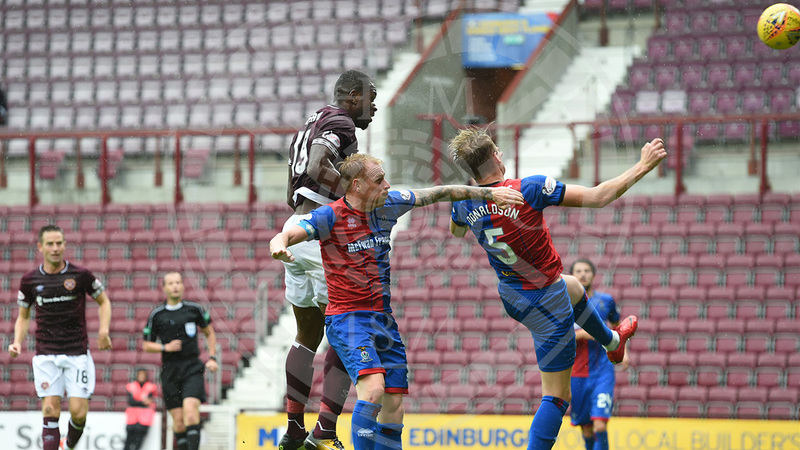 Ikpeazu was in the mix again after 17 minutes, looping a header goalwards after Steven Naismith had crossed from John Souttar’s lay off, but Mark Ridgers pounced to his right to grab the ball. The opening goal came on 28 minutes and it was a cracker. Lee’s corner found Ikpeazu in the middle of the box and he wrapped his right foot around the ball to send a stunning volley straight into the top corner, past a despairing Ridgers. Three minutes later it was 2-0. Naismith was bodychecked at the edge of the box and Garuccio stepped up to curl a magnificent free-kick around the wall and into the top corner of the net. Incredibly, it was 3-0 inside 33 minutes. Garuccio got down the left to float a cross in for Ikpeazu to tower above his man on the edge of the six-yard box and bullet a header into the top corner. Zlamal had to be at his best to deny Caley in the 37th minute. Hearts failed to clear their lines and the ball broke to Walsh, who hit a sweet shot on the turn but the Hearts ‘keeper flung himself to his right to push the ball around the post. From the corner, McKay powered a header on target but Zlamal did well to tip the ball over the crossbar. The woodwork denied Hearts a fourth with a minute of the half remaining. The ball was cleared to Lee who, from 30-yards out, drilled an effort that had Ridgers beaten but not the post, which it struck on its way out of the park. The game was played at a slightly subdued pace after the restart, with Polwarth flashing an effort well wide of the target in the 56th minute. Moments later Naismith teed up Lee with a free-kick but the midfielder slammed it straight at Ridgers. Zlamal produced another great save in the 62nd minute, getting down to his right to push away Polworth’s curling set piece. Hearts put the game beyond any doubt two minutes later. Callumn Morrison tore down the right to loop in a cross to the unmarked Naismith, who guided his header around Ridgers and into the bottom corner. Substitute Lafferty made an instant impact, nearly scoring Hearts’ fifth. Naismith played a neat defence-splitting pass for the striker to run on to, and his low shot beat Ridgers but came crashing back off the post. Hearts continued to go on the hunt for goals, with Naismith teeing up Morrison 25-yards out but he dragged his effort wide of the target. The fifth goal came in the 81st minute. Lee’s set piece delivery saw Naismith rise highest inside the box and loop a header beyond Ridgers and into the net. Substitute Anthony McDonald forced a good save out of Ridgers, letting fly from the edge of the box but the Caley ‘keeper made a smart block. Nathan Austin nearly pulled a consolation back for the visitors in the final minute after being threaded through, but he couldn’t find the target after Zlamal came rushing out to close the angle. Hearts: Zlamal, Souttar, Haring, Berra, Lee, Naismith, Hughes, Garuccio (McDonald, 82'), MacLean (Lafferty, 66'), Ikpeazu (Burns, 79'), Morrison. Subs: Doyle, Bozanic, Mulraney, L. Smith. Inverness CT: Ridgers, Rooney, Tremarco (Calder, 56'), Chalmers, Donaldson, Polworth, Doran (Austin, 60'), Walsh (Mackay, 72'), White, McKay, Trafford. Subs: Hoban, McCart, Oakley, Elbouzedi,.